Acne or pimples commonly develop in case the skin pores become blocked, infected or inflamed. In case the pore clogs and closes, it will bulge, thus seeing the whitehead. This takes us to the common symptoms and types of acne. Acne is one of the commonest skin disorder that males and females experience. Acne normally appears during puberty in females and males. After this stage, the problem may completely disappear or appear to a very less extent. However, there are individuals who will still battle acne throughout their whole life if no treatment is used. 80% of people in their lifetime experience acne due to different causes. Acne which is also commonly known as pimples is tiny swellings normally filled with pus. Acne usually attacks the face, the neck, shoulders, the back, the chest, and the upper arms. 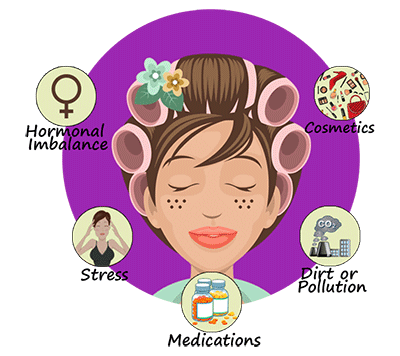 The formation of acne is thought to be hormonal imbalances in everyday life, but that is false or rare. 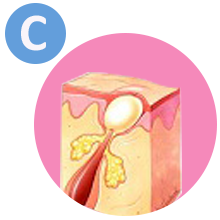 Acne is formed when the male and female hormones trigger or stimulate the oil glands and then acne is formed. 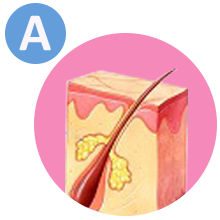 The oil glands are connected to the hair follicle (Pore) in the skin. 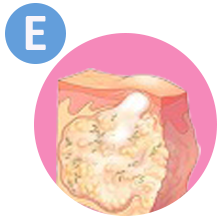 The sebaceous glands make an oily substance known as Sebum, which comes out to the topmost layer of the skin through the follicle. 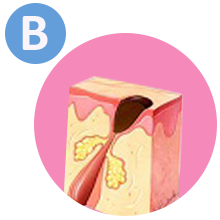 This oil that is trying to get through causes the cells in the pore lining to come together and speed up its shedding, which leads to the formation of a plug at the opening of the follicle. At the end, bacteria will occur and take its course. It will grow and bring about inflammation, which makes the follicular wall to break. WHAT CAUSES ACNE TO OCCUR? There are common beliefs that Acne is due to diet, or hygiene. This is false; Acne is mostly a genetic condition that one can experience in case his or her mother has it. The bacteria that grow in the clogged follicles may also increase the acne breakout. This will lead to the formation of blackheads on the face and other areas. It is a belief among some women that use of contraceptives or any other form of birth control method can cause acne when stopped. This is true to a lesser extent since there are women who also believe that the use of contraceptives prevents acne. Certain drugs or medications that contain steroids and iodides can trigger acne or make it severe. Exposing your face to dust and pollution blocks the pores which cause an accumulation of sebum and dead skin cells. Acne scars lead to low self-esteem and cause loss of a positive body image. They cause many to feel rejected and less recognized in the society. The latest advanced acne scar treatments are very effective in thoroughly eliminating all acne scars to leave your skin smooth with a youthful appearance. WHAT INFLUENCES THE TYPE OF TREATMENT? It is one of the latest methods where a substance known as Levulan is smeared on the affected area targeting the cane glands and a specific wavelength of light is directed to that area. It is a procedure where chemical solutions are used and they are normally sued with other treatments. Salicylic acid is one of the used solutions during acne treatment. Different chemical peels like Glycolic peel, Phenol Peel, and Trichloracetic Acid are used to treat acne scars. Each peel contains concentrated chemicals that are applied on the facial skin for a specified period of time. Each is used after an observation with the dermatologist. It promotes healthy cell growth by killing the bacteria that cause inflammation. It also reduces the size of the pores there by preventing acne breakouts. In this procedure, the dermatologist extracts the blackheads and the whiteheads, mostly those that have failed to respond to treatments. This type of treatment is meant for patients with deeper acne scar tissue and who wish to have it. It offers excellent results when aesthetically used, but will also cause a huge damage when poorly used. It is a non- ablative fractional laser where a laser is used to damage the skin and the skin is left to heal on its own. The acne scars are targeted and after a [period of time, collagen production is stimulated and a new skin will be formed. The pulse-dye laser is one of the used treatments to overcome acne scars. 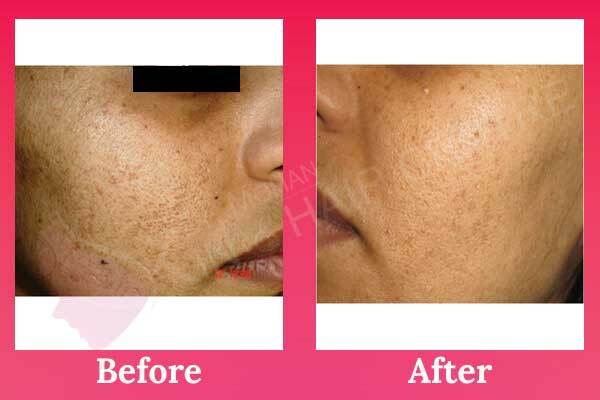 The pulsed dye laser releases a tough beam of light to the acne area and it is absorbed into the blood vessels. Only the affected area is targeted and treated. During the procedure, a cooling device is used to prevent the effect of the heat from the laser. Dermal fillers work by injecting the filler into the acne scars, thereby facilitating collagen production. Hyaluronic based fillers used include Juvederm, Belotero, and Restylane. A topical numbing cream is normally used during the procedure. 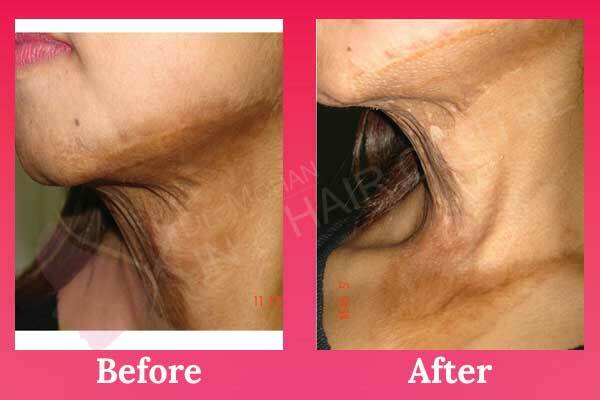 Dermal fillers are used by a majority of patients and have shown remarkable results. The dermatologist utilizes the fractional lasers such as CO2 laser or Erbium laser to completely remove the topmost layer of the skin affected by acne scars. The upper dermal layers are also removed during the procedure. It is best for superficial scars (shallow). 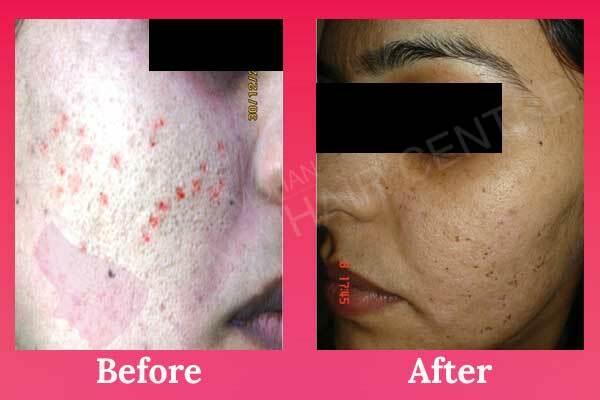 Laser acne scar treatment in India is not so much costly. Its cost depends upon laser used. Our hospital uses the latest technique and advanced treatment. We are no.1 in the market with the best treatment at a good price. At this point, we are to detail what happens before acne treatment, during its treatment, and what happens after.